China buys 300,000 barrels of Venezuelan crude every day, and is eager for more from the Latin American country as part of its global quest for a diverse range of energy supplies. 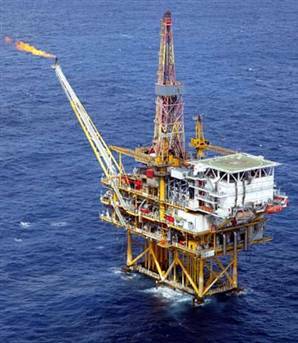 Today, Venezuela said to begin building the first joint Venezuelan-Chinese oil drilling platform in June, according to Energy Minister Rafael Ramirez. China is buying up oil in Iran, Iraq, Russia, Africa and just about everywhere else. China also has an extensive deep sea oil exploration effort ongoing which explains some of China’s recent high seas expansion and belligerence. But not to worry: President Barack Obama will have us out of gas guzzling cars and into all kinds of fuel savers before long. Obama can do this because he already owns a big chunk of Chrysler, will soon own GM, and may own Ford the way things are going. The only profitable U.S. car company, Ford, produces the least efficient cars and will have to retool its fleet to meet the Obama standards…. China has a population of 1.3 billion and wants more oil to power its industry. China now also produces more cars than the USA and wants to put Chinese butts in many new cars during the next ten years. China is also boosting export of Chinese built cars around the globe and will export to the USA startuing next year…. The U.S. population is only 300 million but those folks will get to pay a lot more for cars that are said to be really clean and efficient….. Above: Missile Destroyer Haikou 171 of the PLA Navy’s South China Sea Fleet. She departed with two other Chinese warships on a mission to the Gulf of Aden near Somali on anti-pirate patrol in December. Many in the West see this as a sign of renewed cooperation between China and other military powers. Others see this move as practice for more far flung Chinese naval deployments. WASHINGTON – President Barack Obama is asking consumers to put their money — up to $1,300 per new vehicle by 2016 — behind his plan for higher efficiency standards for cars and trucks and tougher rules on their greenhouse gas emissions. In return, Obama said Tuesday in unveiling the plan, drivers would make up the higher cost of more fuel-efficient, cleaner vehicles by buying less gas at the pump. It would take just three years to pay off the investment and would, over the life of a vehicle, save about $2,800 though better gas mileage, the president said. While requiring that vehicle carbon dioxide emissions be reduced by about one-third by the target date, the plan also calls for the auto industry to build vehicles that average 35.5 miles per gallon. Government regulations have never before linked emission and fuel standards. “The fact is, everyone wins,” Obama said during a Rose Garden ceremony attended by representatives of the auto industry and environmental groups as well as state and federal lawmakers. Is China’s Navy Trouble for the U.S.? Diminishing supplies of oil and natural gas will push countries into violent competition, the Kremlin predicted in a long-awaited national security strategy paper released this week. The document foresees these struggles playing out in the Arctic as well as the Middle East, the Barents Sea, the Caspian Sea and Central Asia — and states that Russia is prepared to fight for its share of the world’s resources. “In the face of competition for resources, the use of military force to solve emerging problems cannot be excluded,” reads the strategy paper, which was signed by President Dmitri Medvedev on Wednesday. It adds: “This could destroy the balance of forces on the borders of Russia and those of its allies.” The paper also addresses the future of NATO and nuclear proliferation, as well as domestic social issues. 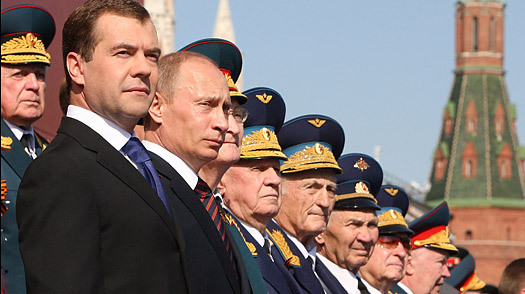 Russian President Dmitry Medvedev, Prime Minister Vladimir Putin, stand with World War II veterans during the annual Victory Day parade on Moscow’s Red Square. The paper was ordered up by Medvedev last August, after Russia’s brief war with Georgia made it clear that a new security policy would need to be drawn up to replace the one set out in 2000, which focused more on playing up Russia’s role in the war on terror while it was fighting a war in Chechnya. The updated paper is meant to be a guide for policy development and implementation until 2020. Venezuela has seized a major oil installation from the U.S.-based Williams companies, Reuters quoted a company source as saying. President Hugo Chavez said his government would begin seizing control of some oil contractors on Friday following the National Assembly’s approval of a law that paved the way for the takeovers. The law approved by the largely pro-Chavez assembly on Thursday enables state oil company Petroleos de Venezuela SA, or PDVSA, to take over contractors without following the usual procedures to expropriate business. “Tomorrow we’ll start recovering the goods and assets that will now belong to the state,” Chavez said in a televised speech late Thursday after the legislative vote. He said PDVSA would seize 300 boats as well as dozens of docks and other transportation installations in western Lake Maracaibo on Friday, and absorb the 8,000 workers affected. Venezuela’s state oil company has recently clashed with domestic and foreign service providers that help extract the OPEC nation’s heavy crude, accumulating billions of dollars in debts as it aims to renegotiate contracts to reduce costs by 40 percent. Considering the brutal recession, you’d expect the Obama administration to be obsessed with creating jobs. And so it is, say the president and his supporters. The trouble is that there’s one glaring exception to their claims: the oil and natural gas industries. The administration is biased against them — a bias that makes no sense on either economic or energy grounds. Almost everyone loves to hate the world’s Exxons, but promoting domestic drilling is simply common sense.